2009 was the year for major structural changes at hedge funds. 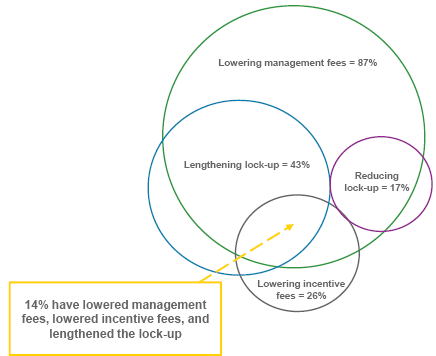 According to the latest E&Y survey of hedge funds, lowering the management fees has been one such key change. Apparently the majority (87%) of managers has lowered their fees or plans to do so shortly. For those who are fans of Venn diagrams, the chart below is a good illustration of the structural changes taking place. Coincident with the fees dropping are the increasing lock-up periods. As existing lock-ups end and redemptions loom, managers are trying to extend the lock-ups in exchange for fee reductions to attract/retain investors.